This is an interesting article about Joy, a working mother of four children. 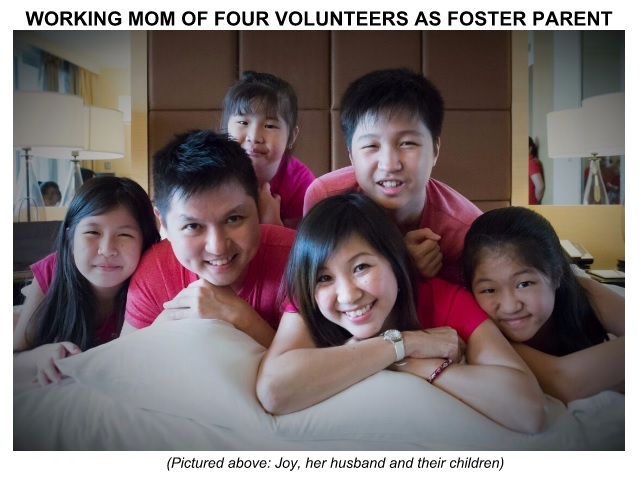 In the article below, she shared some of her thoughts about her family’s fostering journey. I am moved by her willingness to nurture a child in need; and was impressed by her belief that every child should grow up in a loving and supportive home. If her story inspires you, do drop by to Ministry of Social and Family Development (MSF) Fostering Road Show at NEX Mall Level until 15 May 2016.
loving parents and siblings, is the “best stable environment” for a child to grow up in, insists Joy. fulfilled when she was assigned a two-month- old baby girl to care for. foster child when she was at work. arrival of their foster ‘baby sister’. Megan would often run to fetch Anyes or her grandmother whenever she finds the baby awake. She does the same when the baby needs to have her diapers changed. move and stir,” said Joy. Previous story Should I argue back?